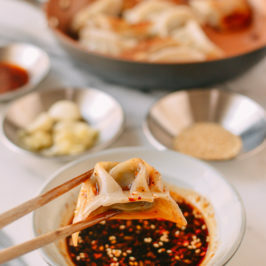 This dumpling sauce recipe makes the perfect dipping sauce for taking your favorite homemade or store-bought dumplings to the next level. Dissolve 1 teaspoon sugar in 1 tablespoon hot water. Then add soy sauce, rice vinegar, chili oil, minced garlic, sesame seeds, and sesame oil. Stir to combine. Serve with freshly cooked dumplings and enjoy!